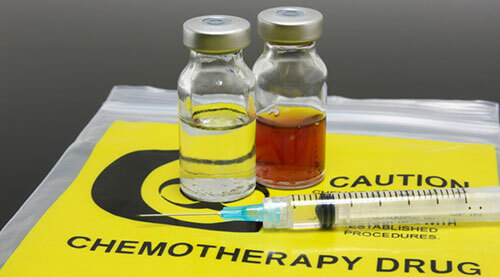 The most hazardous waste in the medical field, out of all the medical procedures, is generated by chemotherapy. They may not be infections, but they are highly toxic and corrosive and therefore don’t usually present risk to the general population, These wastes may cause irreparable damage to natural resources if they are disposed of in an impropriety manner. Our Los Angeles chemotherapy waste disposal experts are here to offer you some guidance in case you get confused in all the terminology and regulations. The Resource Conservation and Recovery Act (RCRA) was enacted by the EPA to mandate procedures for disposal of wastes that are considered hazardous. There exist 4 lists of substances that are specifically listed as hazardous under the RCRA: F-list (non-specific source wastes), K-list (source-specific wastes), and P-list and U-list (discarded chemical products). You will likely have to deal with P-list and U-list substances such as cyclophosphamide, daunomycin or melphalan when it comes to chemotherapy. Characteristic Hazardous Waste: A large organization such as the EPA may not always be able to put together and maintain the complete list of all hazardous substances on the planet. Because of this the EPA has narrowed down the characteristics of a typical hazardous substance. These characteristics include toxicity, ignitability, corrosivity and reactivity. You, as a medical waste generator, have responsibilities to identify these “characteristic hazardous wastes” and manage them accordingly. It is important all hazardous wastes to be separated, properly packaged and labeled, as well as disposed of in the black waste container per EPA’s mandate. When we want to describe chemotherapy waste we usually face the words “trace” and “bulk” . These terms are widely used in the industry despite of the fact that these are not official EPA designations. Trace chemotherapy waste usually includes vials, bags, IV tubes and other items that used to contain chemotherapy drugs, but now qualify as “RCRA empty.” A container that used to hold a P-listed substance is “RCRA empty” only after it’s triple-rinsed. When there is less than 3% of the former volume left you can use a container to hold a U-listed substance is “RCRA empty”. If you come across with the applicable criteria, then this waste can be considered trace waste and can be managed as regulated medical waste and disposed of in yellow containers. If not, it should be managed as hazardous waste. Bulk chemotherapy waste usually includes items that used to contain chemotherapy agents and that don’t qualify as “RCRA empty.” Other types of bulk waste include materials used to clean up chemo spills and visibly contaminated PPE. Keep in mind that the bags of chemotherapy drugs that were unused but are out of date aren’t usually hazardous waste. When a substance can no longer be reused, it becomes waste, and the drugs that are expired, can sometimes be returned to the manufacturer through a “take-back” program. While chemotherapy patients are under your care, can be treated by powerful painkillers, such as morphine or hydrocodone. Find out whether these drugs are listed as controlled substances per one of the DEA’s schedules while disposing of these and other pharmaceutical wastage. While the DEA doesn’t specify any particular packaging to be used for collecting these controlled substances, it has specific regulations concerning to their disposal. If your facility regularly works with controlled substances, you are probably already registered with the DEA. Check with the agency or with your medical waste disposal provider if you have any questions about disposal procedures that may vary between DEA registrants and non-registrants. Have any other questions about chemotherapy waste disposal? Don’t waste time, contact GLYCON LLC (844) 494-8222 to speak with one of our chemotherapy waste removal experts. We serve Southern California ( Los Angeles, Santa Monica, Long Beach, Anaheim, Riverside, Irvine, Santa Ana, Santa Barbara, San Diego…).